1. Your Faith - of Greater Worth Than Gold (1:1-12) - Jesus has shown us the pattern of suffering first, glory later. Therefore we can endure trials now because our eyes are fixed on our future hope. 2. Born Again - Through the Word of God (1:13-2:10) - As Christians, all our blessings and our identity is found in Jesus. We depend on Him and desire the Bible for spiritual nourishment. 3. Christ Suffered - Leaving an Example (2:11-3:7) - We will stand out and be rejected by the world because of our Christ-like behavior in all areas of our lives. 4. Suffering for What is Right (3:8-4:7) - With Jesus as our example, we do not fear what people think but serve the Lord, suffering for the good that we do. 5. Sharing in Sufferings - and Glory (4:8-19) - We rejoice through our trials, knowing that we identify with Jesus in His suffering. 6. Clothed With Humility - Firm in the Faith (5:1-14) - Spiritual maturity is shown through submission and humility. Worldly prosperity and comfort is nothing compared with the glory which is to come. Each segment is approximately 15 minutes. Featured guest is Don Carson, Professor of New Testament at Trinity Evangelical Divinity School in Illinois. NOTE: One study guide is included with the DVD! <a href=/detail.taf?_function=detail&a_product_id=30984 target="_blank">Additional copies</a> are available for purchase. 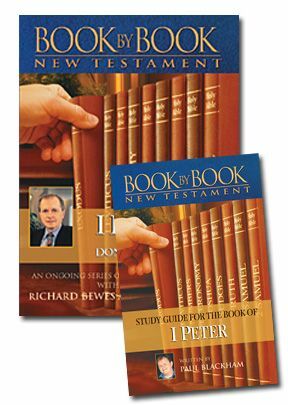 This is an excellent video and booklet study of 1 Peter with world renowned NT scholar Donald Carson, plus Richard Bewes and Paul Blackham. It contains wonderful riches from the Scriptures.